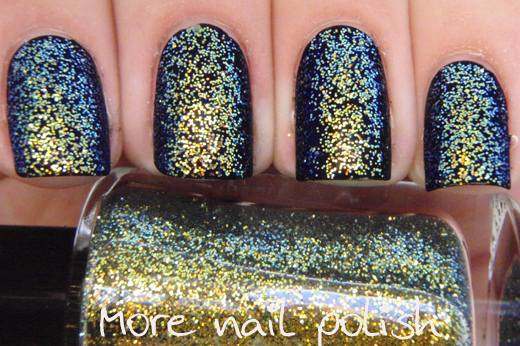 I have two Enchanted Polishes to share with you today. 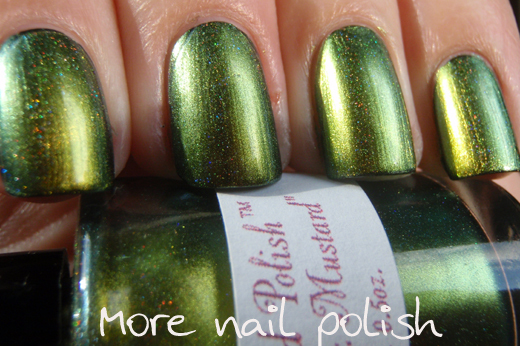 Mean Mr Mustard is a holographic multichrome, along the same lines as the discontinued Ozotic Mish Mash. But the best part is, this shade was never created as an Mish Mash. 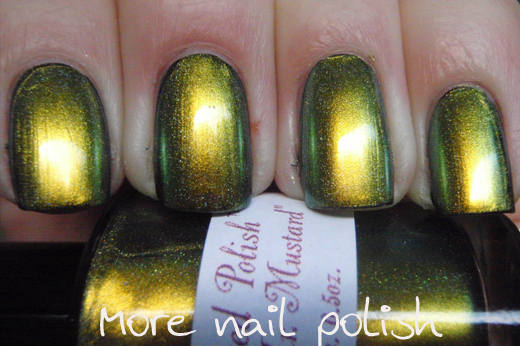 Mean Mr Mustard is a dupe of Ozotic 507 in terms of multichrome colour and shift, but this is also holographic, where clearly Ozotic 507 isn't. The holo sparkle isn't terribly strong, but it is stronger than my photos show. It's so hard to capture both holo and multichrome in one polish. 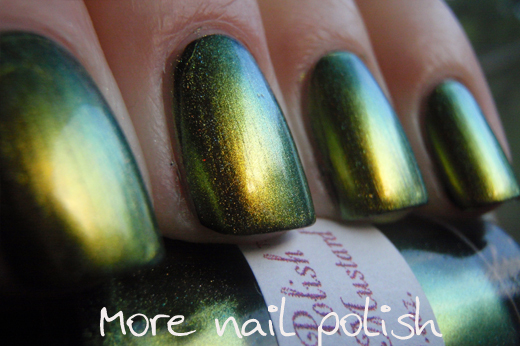 Cause holos love sun, but multichromes look best in the shade. Mean Mr Mustard is also much more opaque than Ozotic 507. You could easily get this opaque on it's own at three coats, but this time I did one coat over a black base. You can see the holo sparkle a bit in this one. 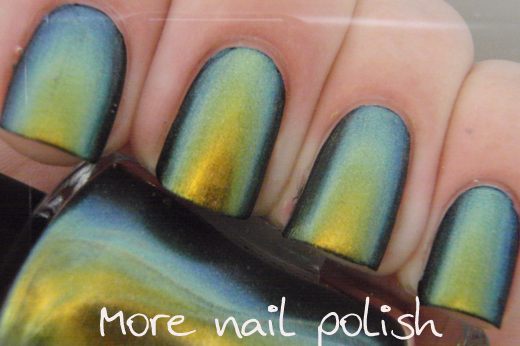 The colour shift is from yellow gold through a minty green to a teal blue. I love these next photos, but I admit that again I have cheated. 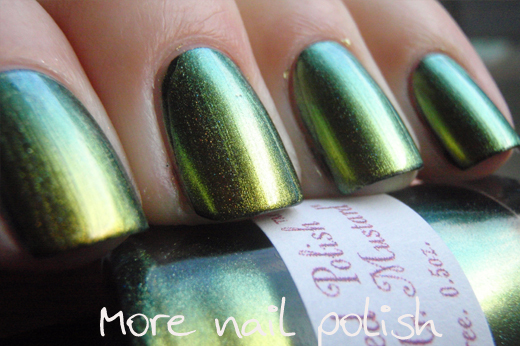 Did you know that the best way to see the full multichromic shift of a polish is to photograph it underwater? Here's the proof. Next is where Mean Mr Mustard say's Hello, New York. Hello, New York is a multichromatic glitter, just like the discontinued Ozotic Elytra's, but again, this shade was never made as an Elytra. 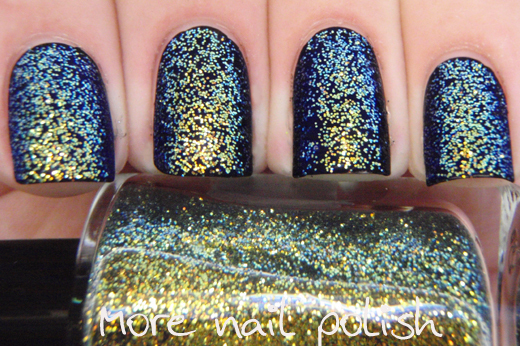 It was released as one of the Hits Phenomena polishes - Borealis I think it was, but I never got those polishes. I remember how much I loved wearing a multichrome glitter over it's matching multichrome shade, so that's what I decided to try first. 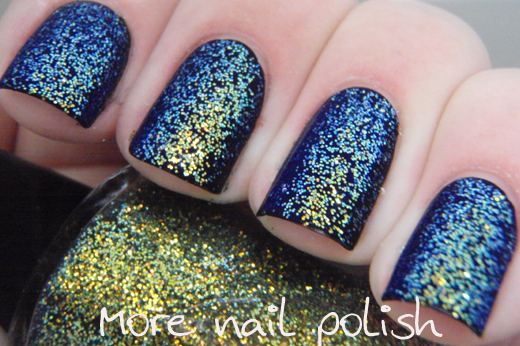 By adding the matching glitter this mani just takes off to a whole nother level. Hello, New York also shifts from yellow gold through a minty green to a teal blue and the glitter payoff is sensational. My biggest complaint with the Elytras was that while they were gorgeous, the glitter applied very sparsely. Not with these. 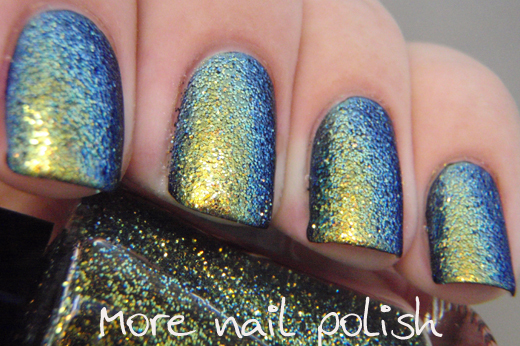 They are very generously packed with the multichrome glitter, and these photos show just one coat of Hello, New York on top of Mean Mr Mustard. 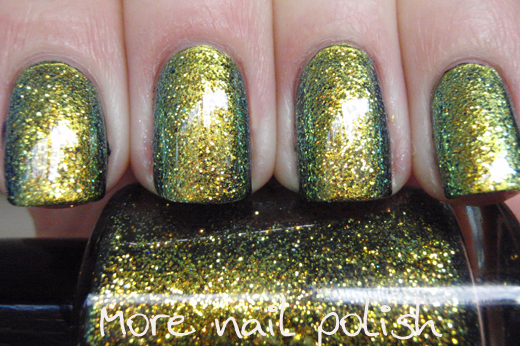 Formula was excellent, the glitter spread out nicely and only one layer of top coat needed. Yep - this looks totally amazing, but in the interests of full disclosure, the next three photos are taken under water. 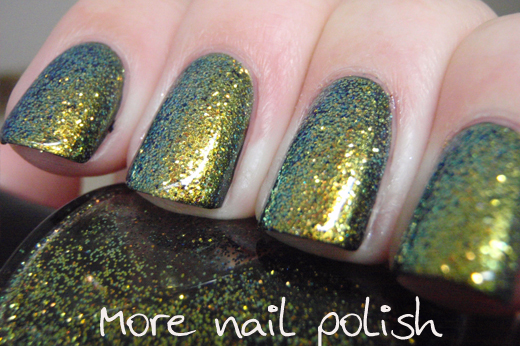 Finally, here is one coat of Hello, New York layered over black. First a regular picture taken indoors near a window. And now the underwater shots. No other trick photography, just stick your hand in some water and you will see this! So, do you think you would have known that some of these photos were taken underwater if I hadn't told you? Or would you just have thought I was some multichrome photographic whizz?? LOL. 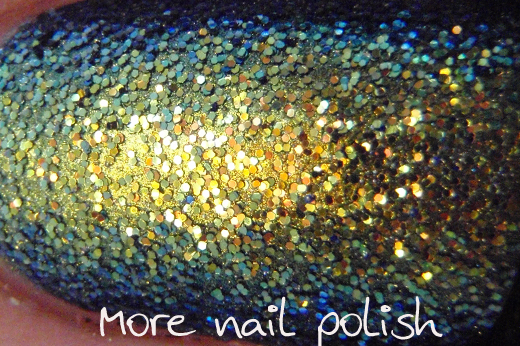 Enchanted Polishes are available from Llarowe for $13USD. Hello, New York is in stock now, but you will need to sign up for the newsletter to find out when the restocks are to get a bottle of Mean Mr Mustard. Enchanted Polishes are also sold at Harlow & Co and Mei Mei Signatures. These polishes were sent for review. Well. I may have to get those for wearing whilst swimming in the crystal clear waters of some tropical paradise (I can dream). Those water pics are awesome. 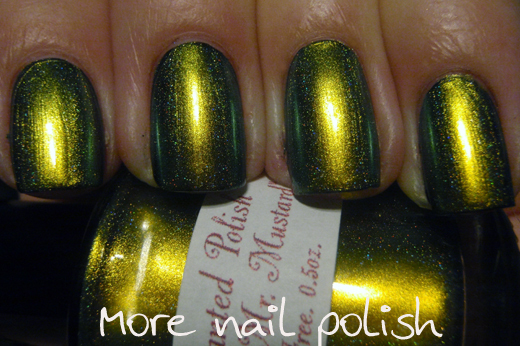 if you hadn't mentioned it I definitely would have thought you were some kind of multichrome wizard. Omg, I love them both! I think You did masterpeace with this shots under water, it's looks so awesome with this blue reflections. Lovely. I have both these colors and have used them together... I like your under water pics. They are awesome. All are pretty colors. It looks just an awesome. 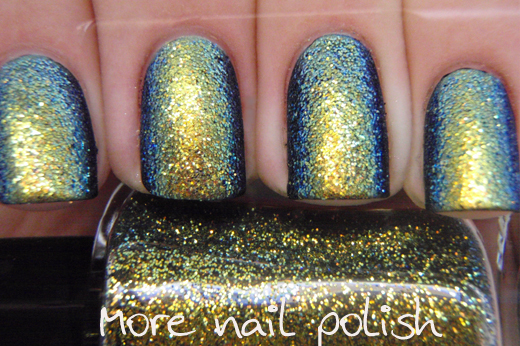 Very cool nail polish!! I hope to find a website where I could buy it in Europe! 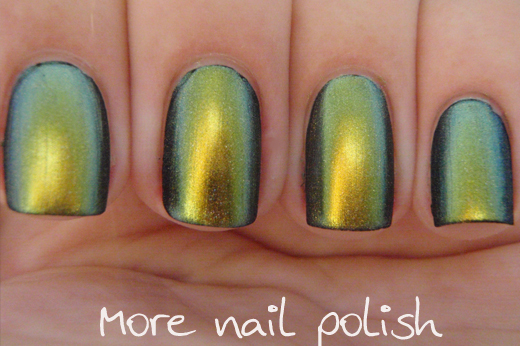 Very cool nail polish!! I hope to find a website where I could import them to Europe!